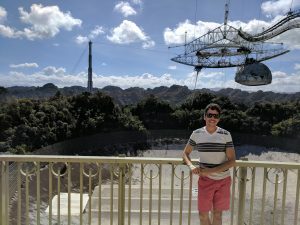 Being the science nerd that I am, I couldn’t pass up an opportunity to visit the Arecibo Radio Telescope. I decided to rent a car and post the details on the hostel’s ride sharing whiteboard. I was sure someone else from the hostel wanted to come check it out with me! Me looking all cool in front of the telescope. Turns out I was right and two guys came along and split the cost of the car rental. Sweet! We hit the road for the hour and twenty minute drive west. The $12USD entrance fee included access to the exhibits and a guided tour. 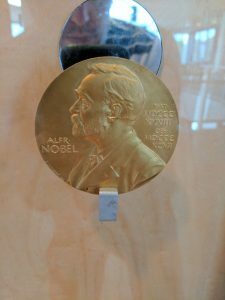 This gave me an opportunity to get up-close and personal with a Nobel Prize. 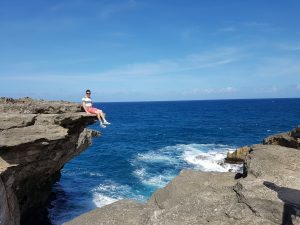 Leaving Aricebo to the east, we decided to stop off at La Cuevea del Indio to checkout why it was the #1 attraction according to Trip Advisor. We spent over an hour exploring all the caves and cliffs in the blistering heat. Taking a break after hiking the cliffs. The next day Frederik and I decided to go on a Rum tasting tour with Bacardi. I’m not a huge fan of the brand, but figured it would still be a good opportunity to visit a functional distillery. 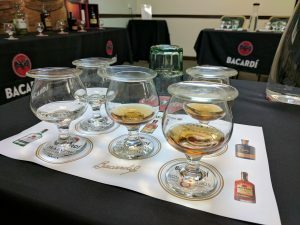 The tasting included five different ages and styles of rum. Taking the 12pm tour meant that we were only joined by two other people. So we essentially had the guide all to our selves! I highly recommend that you do this tour in the morning to avoid the crowds. Learning about the distillation process was nothing new, but understanding what changes you make to this process for rum was. The tasting it self was better than I expected. 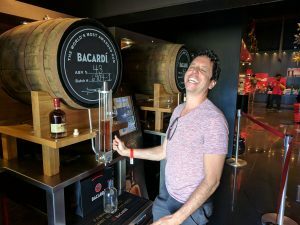 Bacardi does indeed produce sipping rums that are aged between 8 and 12 years old. All of their rums are blended, however. The tour ended with me bottling my own exclusive batch of special reserve that is only available at the distillery. The Bacardi marketing team would be proud.